Saturday evening, the Trojans varsity football team hosted 300 guests at the Second Annual Trojans Football Spaghetti Dinner in the high school cafeteria. Organizer Holly Clayton said the team sold tickets for $5 each and all the food came from the community. The team made $5,100 for their efforts. Those attending received a delicious spaghetti meal with a roll and a salad served by the Trojans’ very own cheerleaders. “That was all profit. Everything was donated stuff to our cause. All kinds of people from the community donated stuff to the dinner. It was not just families of football players, it was people in the community. There were so many people that donated food … but I really don’t want to thank one person because there were so many people that did so much,” Clayton said. The hardworking team made $1,000 more than last year. The army of football moms made over 120 pounds of noodles and made enough pasta to feed 400 people. Nobody went away hungry on Saturday. After dinner, the guests were entertained by an exciting cake and pastry auction. 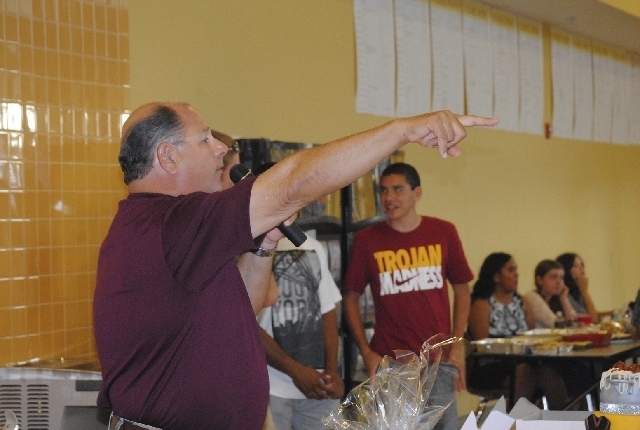 The auctioneer was Trojans Announcer Mike Colucci. According to Clayton, the cake auction brought close to $2,000 on its own. A cake called the “Kit Kat Cake” by Diane Ealand went for $300. The fundraiser dinner benefits the football program, which uses the money to buy new equipment. Each sport is allowed to hold two fundraisers. “The money goes directly to the football program and last year we were able to buy so many things with the money we made. We bought a new sled that the boys are using now. Just to put gear on one football player costs $250,” she said. Monday, the football team took all the leftover donated food, like rolls and dressing and even the leftover spaghetti to VFW post 10054 because they heard the post needs food for its food pantry. The pantry is used to feed 154 vets and could use more donations to stay open.